Following up on the federal class action lawsuit (M.B. v. Corsi) against the Missouri Department of Social Services for the overuse of harmful and addictive psychotropic drugs among vulnerable foster children. More than 30 percent of Missouri’s 13,000 foster children are on at least one psychotropic medication, with 20 percent taking two or more psychotropic medications at the same time. This is almost twice the national rate of such prescriptions. These drugs are known to cause violence and suicide, as well as being addictive. For the first time, a federal court has ruled that the failure to oversee the administration of powerful psychotropic medications to children in foster care could violate their rights under the Constitution. On January 8, 2018 U.S. District Judge Nanette Laughrey denied the state’s motion to dismiss the children’s due process claims. The judge was particularly concerned that the state, by its own admission, fails to maintain complete medical records for the foster children in its care, and does not provide updated health information to foster parents or doctors. Foster children are drugged with harmful psychotropics at 13 times the rate of children living with their parents. Recognize that the real problem is that psychiatrists fraudulently diagnose children’s problems as an “illness”, and stigmatize unwanted behavior or study problems as “diseases.” Psychiatry’s stigmatizing labels, programs and treatments are harmful junk science; their diagnoses of “mental disorders” are a hoax – unscientific, fraudulent and harmful. AMEND: Foster Care regulations to protect foster children and youths from the prescription of psychotropic drugs that can result in physical abuse or injury or endanger the child’s health. a) Such an act shall be considered chemical abuse. b) Chemical abuse shall constitute “child abuse,” punishable in accordance with state child abuse laws. 12 “Worsening Depression and Suicidality in Patients Being Treated with Antidepressants Medications,” US Food and Drug Administration Public Health Advisory, 22 Mar. 2004. 13 “Worsening Depression and Suicidality in Patients Being Treated with Antidepressants Medications,” US Food and Drug Administration Public Health Advisory, 22 Mar. 2004. 17 Thomas J. Moore, Joseph Glenmullen, Curt D. Furbert, “Prescription Drugs Associated with Reports of Violence Towards Others,” Public Library of Science ONE, Vol. 5, Iss. 12, December 2010. 18 Elisabetta Patorno, et al., “Anticonvulsant Medications and the Risk of Suicide, Attempted Suicide, or Violent Death,” Journal of the American Medical Association, Vol. 303, No. 14, April 14, 2010; http://jama.jamanetwork.com/articJe.aspx?articleid=185674 http://www.ncbi.nlm.nih.gov/pubmed/20388896. Periodically we let you know the progress of various proposed legislation making its way through the Missouri General Assembly and suggest ways for you to contribute your viewpoint to your state Representative and state Senator. You can find your Representative and Senator, and their contact information, by entering your 9-digit zip code here. This time, we’d like to discuss Senate Bill SB160, which Creates the Foster Care Bill of Rights, sponsored by Senator David Sater (R, District 29). This foster care bill of rights is primarily concerned with familial stability, which we think is a good thing. We would like to suggest an amendment aimed at reducing the amount of harmful psychotropic drugs regularly given to foster children in Missouri’s care. Missouri Foster Care serves individuals age 0 to 21; not all states provide care to age 21. In FY2014 Missouri extended Medicaid benefits up to age 26 for individuals who have aged out of foster care. Medicaid pays for the psychotropic drugs given to foster children. The high rates of psychotropic medication use in the Medicaid population, risks associated with these drugs, and research documenting inappropriate prescribing, have raised concerns, especially for children involved in the child welfare system. Total foster care drug costs in Missouri have averaged roughly $16 Million per year, with a total for the five years 2010-2014 over $81 Million. All of these psychotropic drugs given to Missouri foster care children between the ages of 0 and 26 are harmful and can have serious side effects including violence and suicide. normal dose and an overdose. (g) To have prescribing doctors disclose any financial ties they have to pharmaceutical companies in writing in an age appropriate manner. Contact your Missouri state Representative and Senator, and let them know what you think about this. Such an amendment to the proposed legislation would certainly strengthen the rights of foster children and reduce the administration of psychiatric drugs, since they are all inherently damaging to young children and should not be held as standards of care. Dr. Hansa Bhargava, a practicing pediatrician and medical editor with Medscape, is starting to recognize that drugs should not be the first line of therapy for children with symptoms of difficult behavior. While ADHD itself is a fake illness, the observed symptoms are real, and the root causes must be diagnosed, recognized, and treated for whatever they are. Children are being diagnosed with symptoms of so-called ADHD at younger and younger ages. Instilling good behavior and lifestyle habits as they grow will help them improve as they move into adolescence and adulthood. There is growing evidence that the first approach in addressing these symptoms should be nonpharmacological. For example, the National Sleep Foundation reported that as many as 80% of teens do not get enough sleep. Sleep-deprived kids often lack focus and may have symptoms of hyperactivity, which can mistakenly be attributed to this fake disease. Dehydration may have effects on one’s ability to control one’s behavior. And exercise is well established as important for overall physical fitness, growth, and mood, but it turns out that it may be particularly helpful in kids with behavioral symptoms. A “diagnosis” of ADHD is based solely on opinion, and should never be taken as a fact before non-psychiatric, clinical evidence determines what is actually medically the case. What is ADHD then? In 1987, “Attention Deficit Hyperactivity Disorder” (ADHD) was literally voted into existence by a show of hands of American Psychiatric Association members and included in the Diagnostic and Statistical Manual of Mental Disorders (DSM). Within a year, 500,000 children in America alone were diagnosed with this. It is an excuse to sell drugs and make money. The ADHD diagnosis does not identify a genuine biological or psychological disorder. The diagnosis is simply a list of behaviors that may appear disruptive or inappropriate. Studies suggest that appropriate prescribing practices, that is, adhering to FDA-approved use and accepted clinical guidelines, may not always be followed for certain Medicaid populations such as the high-risk populations of children in foster care. In actual fact, multiple studies and reports have found that children in foster care are vulnerable to inappropriate or excessive drug use. Children in foster care are often prescribed more than one psychotropic drug at the same time. A review in Missouri once found some children in foster care prescribed five or more psychotropic drugs. Missouri Foster Care serves individuals age 0 to 21; not all states provide care to age 21. In FY2014 Missouri extended Medicaid benefits up to age 26 for individuals who have aged out of foster care. In Fiscal Year 2015, Department of Social Services MO Healthnet (Medicaid) spent $1,254,900,000 for pharmacy services for 883,672 people, approximately 60% of whom were children. There were an average of 13,033 children monthly in Foster Care (19,429 individuals for the year.) The total 2015 state population of children under 18 was 1,399,075. You can see that over the last four years, Missouri has been experiencing an increase in the Foster Care population, which in 2015 was the highest in the previous 12 years; indicating at the very least unmanageable caseloads. For 2008, Medicaid Pharmacy Benefit statistics for Missouri from the Centers for Medicare & Medicaid Services show 122,274 children 5 years of age or younger; 121,095 ages 6 to 14; and 54,645 ages 15 to 20. This includes children in foster care. 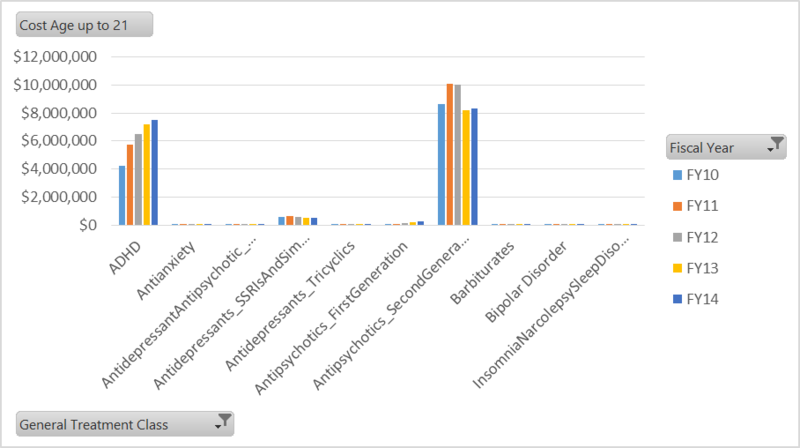 The top drug group for all these prescriptions in terms of cost was antipsychotics. Missouri consistently ranks nationally in the bottom one-third of overall health status as compared to other states. Nationally, about 14 percent of Medicaid beneficiaries used a psychotropic medication during calendar year 2011. In 2011, Medicaid spent about $8 billion in fee for service for psychotropic medications—30 percent of the program’s total fee-for-service drug spending. 1. Top costs are for ADHD drugs and Antipsychotics for all ages. 2. ADHD drug costs appear to be increasing year over year. 3. Babies less than a year old are more commonly given Barbiturates, one presumes as a remedy for insomnia. Barbiturates are highly dangerous because of the small difference between a normal dose and an overdose. 4. Total foster care drug costs have averaged roughly $16 Million per year, with a total for the five years 2010-2014 over $81 Million. Approved by the Governor 09/30/16. Requires the Department of Social Services (DSS) to convene a working group to develop standardized information about the rights of all minors and nonminors in foster care, and expands requirements regarding the distribution of information regarding these rights. A bill to amend the existing Foster Child Bill of Rights (WIC 16001.9) to strengthen the rights of foster children to participate in any decision to require mental health treatment and psychotropic medication. The state of California finds that Foster Children are subjected to excessive diagnosis and treatment by psychotropic medications, and hereby amends the Foster Child Bill of Rights to include the following additional protections for children under the care of Child Protective Services. [British] act in a vacillating or indecisive manner. Psychiatry and psychology employ havering as a method of professional communication. Otherwise known as “psychobabble,” this speech mechanism can put those unaware of its nature in a confused state. Googling the word “psychobabble” returns 456,000 results. It’s a popular pastime. The word “psychobabble” came into popular use after the 1977 publication of Psychobabble: Fast Talk and Quick Cure in the Era of Feeling by R. D. Rosen, leading to another interesting definition: jargon speech that is heavily based on experience and emotion instead of well-known science. Here is an example: bipolar. Yes, the word “bipolar” is a classic example of psychobabble, because when people claim they are bipolar they’re really saying that they are just moody. Saying you’re bipolar abdicates all responsibility for the control of your emotions. Scanning the brains of children and adolescents labeled with ADHD is one of the latest psychobabble ideas being used in an attempt to bring some credibility to this fraudulent diagnosis, demonstrating that psychiatrists are still looking for an answer to justify the widespread drugging of children and adolescents. Of course, the biggest psychobabble scam is the Diagnostic and Statistical Manual of Mental Disorders (DSM). And if you chewed on a page from the DSM while reciting one of its fraudulent diagnoses, you could be accused of havering your babble and eating it, too. A leading psychiatrist featured in the Huffington Post just admitted what CCHR has said for decades — mental disorders are not medical conditions. While the number of psychiatrists worldwide declined 15% between 2005 and 2011, the number of psychiatrists in the U.S. rose 180% from 1975 to 2012. The global sales of antidepressants and antipsychotics rose 3% from 2006 to 2013; while the U.S. sales of these harmful drugs increased 5% from 2006 to 2012. U.S. sales of ADHD drugs rose 197% from 2006 to 2012. In 2011, 100,000 people in the U.S. were electro-shocked. In 2014, the U.S. Veterans Administration mental health budget was nearly $7 Billion. It isn’t over. The total number of children and adults taking ADHD drugs rose from 6.7 million in 2006 to 10.2 million in 2013. The total number of Americans on all psychiatric drugs rose 19% from 2005 to 2013. We’re effectively destroying an entire generation with harmful and addictive psychotropic drugs. Contact your local, state and federal officials and representatives, and let them know what you think about this. Find Out! Fight Back!